1.drive day- live at the ironwood in calgary joanna drums vocals scott guitar/ harp bass pedals voice. recorded and mixed by miles wilkenson. 2.40 years late-demo-recorded at bedside studios by len milne- scott- all instuments - joanna miller-backing vocals. intro phone message from ashley mayes. 3.stray dogs- from the o/n cd (out of print) written by scott and dan frechette-dan-elec guitar- sky- standup bass/ backing vocals- scott- guitar & voice. 4.darlene- live at the park theater in winnipeg- gilles fournier-standup bass- paul balcain-sax- damon mitchell- guitar- sky onosson-guitar- joanna- drums/vocals-scott-piano/harp/voice. 5.johnny tornado-written by big dave mclean-from the tribute to dave- gilles fournier-bass- paul balcain-sax-chris carmichael-guitar-joanna drums-alice ramsey-vocals-scott- guitar/voice. 6.clint duty- demo from postcards sessions- paul yee bass/banjo- scott-drums/guitar/organ/voice/toy robot. 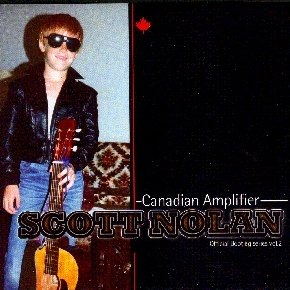 7.cigarettes & alcohol- home demo- scott- all instuments. 8.st james infirmary-tradd- patrick oconnell- guitar/vocals- grant siemens-banjo-paul balcain- clairinet- scott-drums. patrick was a great canadian poet search him out. 9.90 miles an hour- live at the park theater in winnipeg same info as track four. 10.blag flag blues- written by adam carroll and j newcomb. from the adam carroll cd "old town rock n roll". scott- piano/voice/bass/guitar - joanna drums/vocals- mark and joy jungers-backing vocals. 11.everything to everybody- home demo- paul balcain-sax-scott- guitar/bass/drums/voice. 12.girl from west virginia-home demo- sky-bass/wurlitzer/percussion scott-drums/guitar/percussion/vocals. 13.sing- produced by james creasey- scott- guitar/voice. 14.guns guns guns- from the guess who's home tribute-written by cummings/winter scott-guitar/voice- sky-bass/vocals-joanna drums/vocals-damon mitchell-guitar/vocals. 15.train wrecked love song- home demo- sky-bass/fender rhoades- scott- drums/vocals/guitar. 16.over the moon- produced by james creasey- same info as track 13. 17. sounds you make- recorded with students at mid ocean studios- scott-guitar/keyboards- paul yee-bass- paul balcain-sax- joanna- drums/vocals- sarah dugas- vocals- grant siemens- guitar.